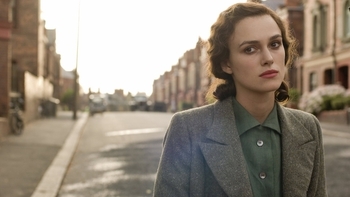 Atonement is a Film programme that first aired in 2007 and has been classified a 15 certificate. Keira Knightley, James McAvoy, Romola Garai and Saoirse Ronan star in Joe Wright's Bafta award-winning period romance, adapted from Ian McEwan's bestselling novel. The story opens on a stiflingly hot summer day in 1935 at the country estate of the Tallis family. Thirteen-year-old Briony Tallis, a precocious would-be playwright, has a crush on Robbie Turner, the groundsman's son. The trouble is, so does Briony's elder sister Cecilia; and what's more, the two of them are engaged in a passionate affair. When Briony discovers this, she concocts a terrible lie on a spiteful impulse, which has dramatic and far-reaching consequences. As the narrative shifts to 1940, Cecilia has ostracised herself from her family and remains faithful to her outcast beau; Robbie finds himself injured and trapped on the beaches of Dunkirk; and Briony is desperate to right the wrong she caused. Christopher Hampton, the screenwriter of Dangerous Liaisons, skilfully takes the best from Ian McEwan's bestselling novel, creating a modern Brief Encounter that was nominated for seven Academy Awards, including Best Picture. And director Wright, who wrought a career-best performance out of Keira Knightley in Pride And Prejudice, repeats the feat. Anchored by the increasingly impressive McAvoy and featuring a bravura sequence at Dunkirk, this magnificent drama was one of the major films of 2007. Peter O'Connor ... Police Sgt.